Patch 1.15 is out now for NBA Live 19! As always, the latest update should come through automatically as long as your PlayStation 4 or Xbox One is online. If you do run into any difficulties, try restarting your console, or checking for the update manually. 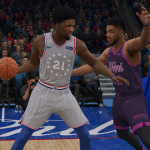 The new patch includes the recently unveiled City uniforms, which are available in Play Now, Franchise, and The League. Gameplay has also been tuned, specifically the impact of contested shots. A couple of technical issues have been addressed, and new functionality that allows users to skip examining items when opening rewards has also been added. Please see below for the full patch notes. I’ve also added them to the update history for NBA Live 19 over in our Wiki. Feel free to share your impressions in the comments section below, as well as join in the conversation here in our NBA Live 19 Forum.